Lady Gaga, Jada Pinkett Smith, Alicia Keys, Michelle Obama, and Jennifer Lopez at Sunday’s Grammy Awards in Los Angeles. Country singer Kacey Musgraves and rapper Childish Gambino were the big winners at the 61st annual Grammy Awards. Musgraves took home album of the year honors for her fourth album, “Golden Hour,” which also won best country album, and she also won awards for best country solo performance (“Butterflies”) and best country song (“Space Cowboy”). An absent Childish Gambino (a.k.a Donald Glover) scored big with two major awards — song of the year and record of the year — for the cutting political rap “This Is America,” which also won Grammys for best music video and best rap/sung performance. Music’s much-ballyhooed biggest night came pretty close to delivering on Sunday evening. It was an awards show telecast surprisingly light on politics, hashtags, and stunts, and surprisingly lousy with non-lousy musical performances — which may be a Grammys first. “I got you. I’m gonna take care of you tonight,” Keys assured the audience early in show — and she wasn’t kidding. 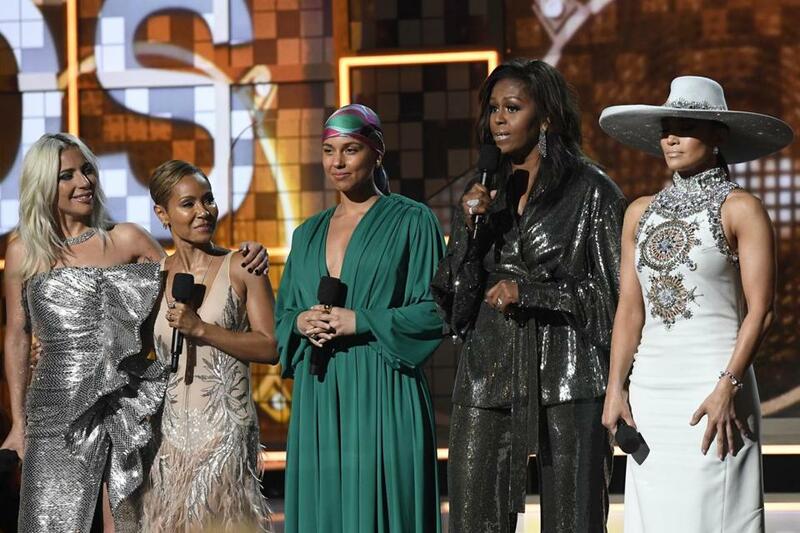 For support, she brought out “some of [her] sisters”: Jada Pinkett Smith, Lady Gaga, Jennifer Lopez, and former first lady Michelle Obama. Call it a tone-setter. The answer, as any Beyhive member will tell you, is “girls.” But for our purposes we’ll go with “women,” who, lucky for anyone who settled for the duration, ran the show this year. After all, six out of the eight best new artist nominees this year were women — including winner Dua Lipa, who fearlessly took on an orchestra eager to cut to commericals. And the lineup of the evening’s performers leaned heavily ladyward, with Grammy magnets like Cardi B, Lady Gaga, Brandi Carlile, and Janelle Monáe alongside legends like Dolly Parton, Diana Ross, and a paint-peeling tribute to Aretha Franklin featuring Yolanda Adams, Fantasia, and Andra Day. Oh, and exactly zero 12-dude guitar brodowns. Before the telecast, Carlile won for best Americana album for “By the Way, I Forgive You,” as well as best American roots performance and roots song for “The Joke” — of which her barnburner performance brought a stunned audience to its feet during the show. Drake scored the best rap song for “God’s Plan.” And Lady Gaga took trophies for best pop solo performance — for “Joanne (Where Do You Think You’re Goin’? )” — as well as best pop duo or group performance and best song written for visual media for “Shallow,” the breakout hit from the “A Star is Born” soundtrack. But the Grammy Awards remained something of a misnomer, with just a handful of the 84 categories presented during the telecast. This left a lot of room for performances; and this year’s crop of performers skipped the usual glut and bloat of Grammy musical numbers. The women on this stage weren’t bringing pyrotechnics so much as the heat. A sprawling tribute to Parton, who was recognized with this year’s MusiCares Person of the Year award, was far and away the night’s biggest kick. Parton emerged between Musgraves and Katy Perry for a snippet of “Here You Come Again”; traded pleas to “Jolene” with Miley Cyrus; took an a capella dip into “After the Gold Rush”; had Little Big Town back her up for “Red Shoes” (from the “Dumplin’” soundtrack); and called an all hands for a romp through “9 to 5.” At least one reviewer reported being ready for bed. A tribute to Diana Ross (ahead of her 75th b-day) made me just happy (and frankly relieved to have my inhaler handy). Ross rose atop a glowing staircase in a crimson gown for a few lines of “The Best Years of My Life,” she strolled the rows of the Staples Center for “Reach Out and Touch Someone’s Hand,” and she retook the stage to tell the audience that anything is possible — and to wish herself a happy birthday. Earlier in the evening, the singer H.E.R. (who took home Grammys for best R&B album for her self-titled debut, and best R&B performance for the single “Best Part”) offered a stirring performance of “Hard Place” that bloomed into a crescent of choral singers, string players, and H.E.R. stalking the stage while conducting a Hendrix-esque Q&A with her guitar. Cardi B (who took the best rap album honors for “Invasion of Privacy”) gave a breathless acceptance speech (“Maybe I need to start smoking weed!”) and a tight performance of “Money” punctuated by the staccato pokes of pianist Chloe Flower. Monáe gave an appropriately futuristic run through of “Make Me Feel,” flanked by a fleet of femme-bot stormtroopers, summoning Bowie, Nomi, and (oh, let’s just say it) St. Vincent. St. Vincent for her part, tore through a skeletal take on “Masseduction,” joined halfway through for an angular duet with doppelganger Dua Lipa. And Chloe x Halle’s acrobatic take on lifetime achievement award recipient Donny Hathaway’s “Where Is the Love” was revelatory.